I love baking and I love creating new recipes - but sometimes I just don't have the time. Since we got back from Hawaii, life has been busy - to say the least. Every day has been booked and most nights spent totally exhausted. The weekends have been full and hectic and the only time I spent in the kitchen was to make meals that I'd made time and time again before. That was, until this weekend. On Saturday morning I had a few hours free and I knew exactly what I wanted to do: bake. I went in the kitchen, pulled out a tiny little notebook tucked away in the cupboard by the stove. On the front of the frangipani notebook, in my 14-year-old handwriting, is "Kristy's never fail recipes"... apparently, I didn't have too many successful recipes back then because there are only a dozen or so in this book, but they are all ridiculously good. 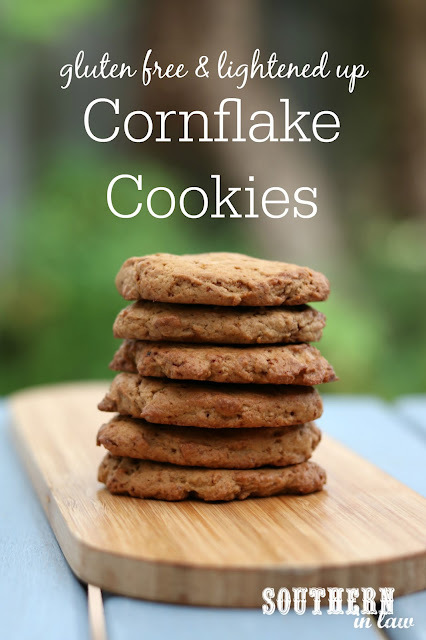 I knew exactly what I was looking for; my cornflake cookies recipe. A recipe I haven't ever made for Jesse but knew he'd love - and so that's what I did. I pulled the mixer out of the cupboard above, turned the oven on, grabbed the ingredients I needed and set to work on creating one of the simplest recipes I know - but also one of the most delicious. Add your egg, vanilla and applesauce and mix until combined. Add in your dry ingredients and mix until combined. It will be quite soft - but don't worry! That's how it's supposed to be. Scoop heaped tablespoons of batter onto your prepared trays, flattening into a circular cookie shape about 1/2 cm thick with wet fingertips or the back of a wet spoon (this stops the batter sticking). Once all of your cookies are shaped, bake for 10-12 minutes or until golden and the edges are firm. These cookies are best on the day they are made but will last for 2-3 days in an airtight container. These cookies are soft in the middle but crisp and crunchy on the outside. Baking them for longer will make them crunchier - but their middles will still stay soft. If you want a firmer cookie, leave out the applesauce entirely. And do you have recipes you've kept and/or remade for years?